On Saturday, November 19, 2011, Connecting Countries Adopt-a-School; a non-profit organization whose purpose is to promote the education of children in Kenya and Canada through projects designed to improve the quality of education environments in Kenyan public schools, will be hosting their 2nd Annual Potty Party to celebrate World Toilet Day at St. Paul’s Anglican Church in Hamilton, Ontario, from 1:00 p.m. until 5:00 p.m. The event will have plenty of activities to keep the entire family entertained with games such as; Potty Putting, Toilet Paper Bowling, Plunger Toss and the Toilet Paper Toss. There will also be $5 crafts for sale such as; Potty Portraits, Paint Your Toilet Tile, Dress Your Plunger and Safari Soap Making. Also, the event will host a silent auction, as well as a Kenyan “Kid Art” Sale, a “Sitting Pretty” Exhibit and will have an assortment of Kenyan food samples for everyone to taste. “I hope the kids have a lot of fun, that’s what the whole Potty Party is geared around, it’s about bringing the entire family together, while entertaining the kids and educating them,” said Jason Pottinger, who helps out with Connecting Countries whenever he can. 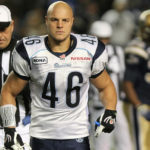 “The kids will be having fun and learning and they wont even know that they’re learning because they’re having so much fun,” added the Argos linebacker. Connecting Countries is a Hamilton-based organization that plans on raising funds at this year’s Potty Party in order to build and maintain clean and safe latrines in Kenyan schools because without them, Kenyan schools are in danger of closing. Their program doesn’t just help out Kenyan children; they also help out Canadian children. Through their Penpal Program, Connecting Countries helps teach both Kenyan and Canadian children about life for their peers in a different part of the world, while allowing them to make personal connections with them and showing them that they can make a difference in each others lives. “Connecting Countries is one of those things that you can support no matter where you are. I will forever pledge my support to help them out no matter where I am,” stated Pottinger. They are hoping to spread the word of both their charity and World Toilet Day, but they are also trying to raise awareness of the situation that is going on in Kenya, which they are doing their best to fix one day at a time. “You want to raise as much money as possible. Last year was our first year and we did about $7,500, so our goal this year is to obviously beat that mark because you want to increase every year to get closer to your goal,” concluded Pottinger.